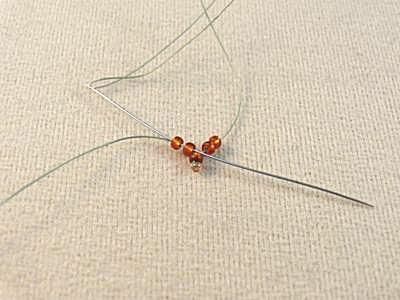 On a comfortable length of thread (no longer than 5'), pick up a stop bead and center it in the middle of the thread. Then, pick up 3 size 11 seed beads and a size 15 seed bead. Skip the size 15 seed bead and pass back through the third size 11 seed bead. Pick up two more size 11 seed beads. Pass needle and thread through the first two seed beads strung and pull snugly. Pass needle and thread through the last two seed beads strung. Remove the stop bead. On the tail thread, pick up 2 size 11 seed beads. With your working thread, pick up 2 size 11 seed beads. Pass needle and thread through the 2 seed beads you just picked up on the tail thread, and then back through the 2 size 11 seed beads on the working thread. Pull snugly so that the beads line up against each other. Pick up 2 size 11 seed beads and pass needle and thread through the last two seed beads added. Pick up a size 15 seed bead and pass needle and thread down through 3 seed beads of the base. Pick up a size 15 seed bead and pass needle and thread through the 2 size 11 seed beads just added. To add the next stitch, pick up 4 size 11 seed beads. Pass needle and thread back through the first two beads picked up and pull snugly so that the two pairs of beads line up next to each other. Add two size 15 seed beads as you did in Steps 4 and 5. Continue stitching in this manner until you have 9 size 15 seed beads along the bottom of the strip of beadwork. Complete the second side of the leaf in the same manner as the first. If you don't have a needle on the other working thread, put one on now. On each thread, pick up 4 size 11 seed beads. Pass each needle through the four seed beads on the other thread. To secure the two sides and firm up the leaf, pass needle and thread through the remaining seed beads on either side. On each side, pick up 2 size 11 seed beads and 1 size 15 seed bead. Pass needle and thread through the corresponding size 11 of the previous row and then back through the two size 11 seed beads just added. On each side, pick up a size 15 seed bead and pass needle and thread back down through the three beads added in the previous step. On one needle, pick up four size 11 seed beads and pass needle and thread through the remaining beads of the row. Pass needle and thread from the other side through the beads just added as well. Choose one side (it doesn't matter which one) and knot the thread in the beadwork, weave the thread in a bit and then trim close to the beadwork. You are now ready to add the "veins" of the leaf. Using the remaining thread, weave needle and thread through the base so that you are exiting the center bead of the first (inner) joining row. Pick up 17 size 11 seed beads. You may have to adjust your seed bead count depending on the size of your leaf. Pass needle and thread through the center thread of the top of the base and then back through the last three seed beads just strung. *Pass needle and thread through the nearest size 15 seed bead and back through the beads just added. Pass needle and thread through the next seed bead in the main branch and then repeat from * to add another branch. Repeat along the main branch to add as many smaller branches as desired. When you are finished adding branches, weave the thread into the beadwork, knot and add a drop of glue if desired, weave in a little more, and trim the thread close to the beadwork. Make a cluster of leaves to use as a pendant. Attach them to a peyote tube and slide them onto a beaded rope or another necklace. Attach two leaves together to use as a centerpiece for a bracelet. Make two clusters of leaves using all size 15 seed beads and hang from ear wires with tiny gemstone rounds as "berries". Tack several leaves down on a wide strip of peyote or herringbone for a fantastic fall bracelet.